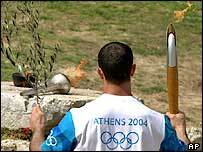 THE SCRIPT: A message purporting to be from representatives of the Olympic Organizing Committee asking for help in disbursing funds for medical facilities at the Athens Games. Too much money has been allocated, it says, and as a trustworthy person, you've been selected to nominate an account to transfer the remaining $19m into. Please do not go public with this, it says, so as not to jeopardise the hospitals' chance of receiving the funding. For your trouble, you will receive 20%. THE CATCH: "My initial reaction was to laugh, to be honest," says BBC News Online user Ian Pearse. "We get so many of these at work, all written in over-friendly English with bad spelling, supposedly having been given our names as honest people." If this ploy seems familiar, it is - it's a variation of the advanced fee fraud most commonly associated with requests for help in transferring government funds out of Nigeria (or the Philippines, or Eastern Europe...). Those who respond will be asked for their - or their company's - bank account details, identification such as a photocopy of a passport or driver's licence, and an administration fee which may run to thousands of pounds. Previous scammers have asked for funds to cover the cost of wiring money out of the country, or to pay for a security firm to transfer such a hefty wedge to the bank. It should come as no surprise to learn that if a proposition seems to good to be true - that your name has been chosen out of all the people online in the world, that millions can be yours for such a seemingly simple task - then it is. These scams hope to appeal to people's greed or their wish to help others. Following efforts to crack down on the now notorious Nigeria 419 scam, the fraudsters have changed their tactics. Millions of unsolicited e-mails are sent out each year, purportedly from officials - in this case a doctor charged with testing athletes' blood - a banker, a distraught relative, who wants your help in the deal of a lifetime. 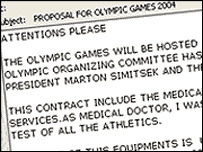 To gain trust, many impersonate real people or claim to represent genuine organisations such as the Olympic Organizing Committee. Some set up elaborate websites to help convince the victim that the deal is genuine. Those who have been drawn in by such a scam should report it to the National Criminal Intelligence Service or contact their local police force. We want to know the latest scams whether they come by text, e-mail or phone call. Let us know the latest ones you've come across, using the form below.